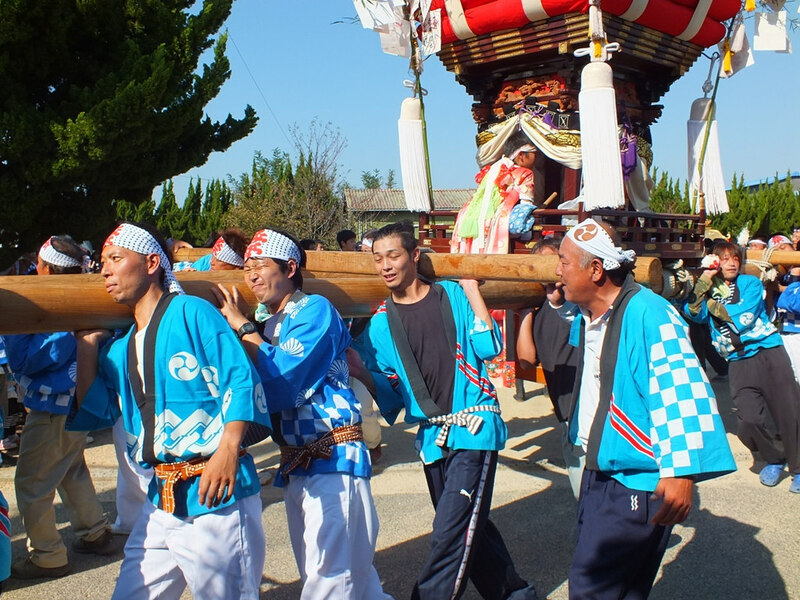 So, last Sunday, I went to Teshima. 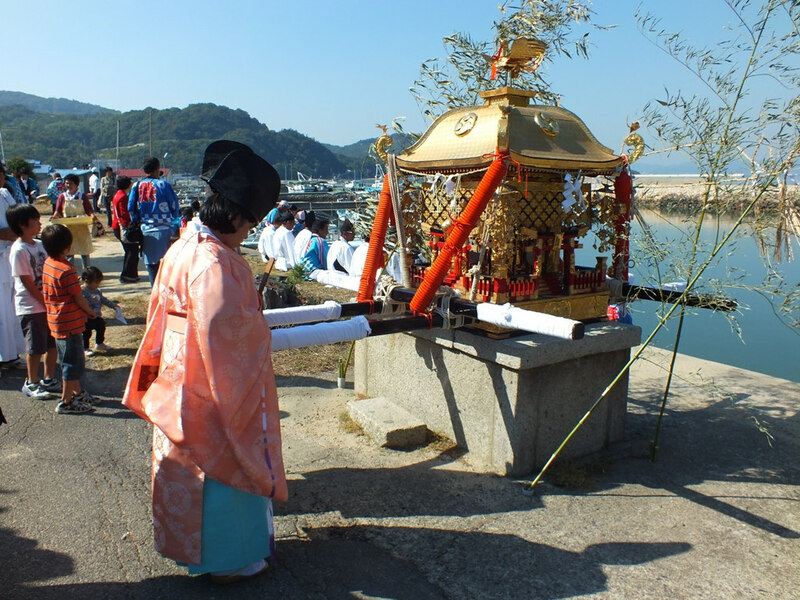 It was part of my mini Seto Islands Tour, but it was more than that. In a sense I had to be there on October 21st and not another day. 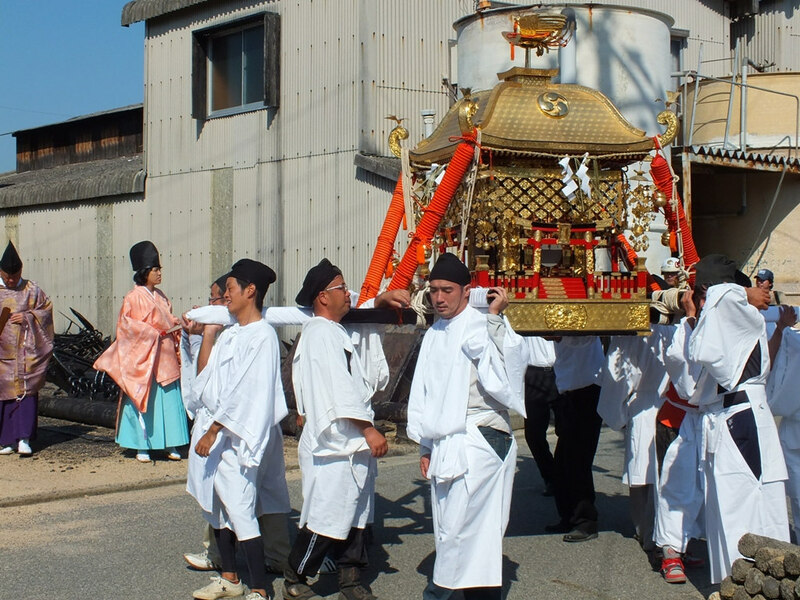 Well, because it’s the day of the Karato Hachiman Matsuri. 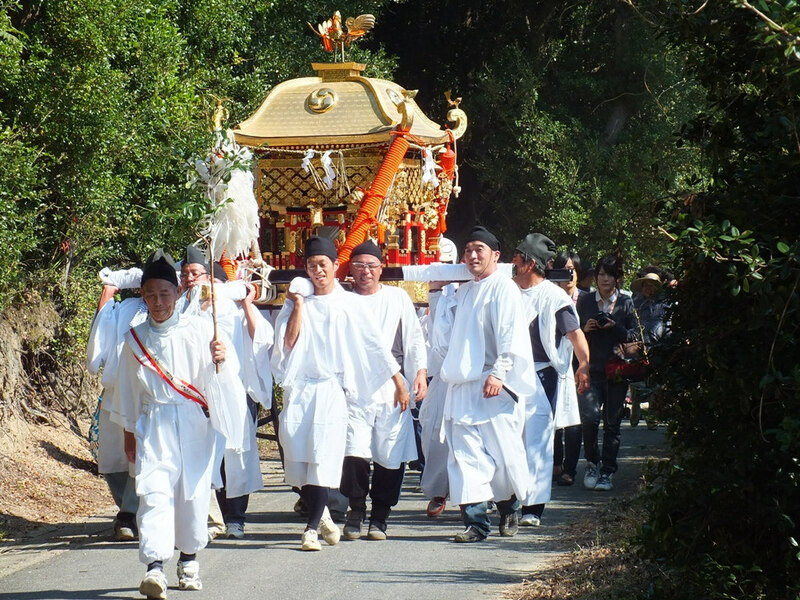 And, the Karato Fall Matsuri, despite being one of the smallest matsuri I have ever attended, may just be the one that matters the most to me. The reason is pretty simple. 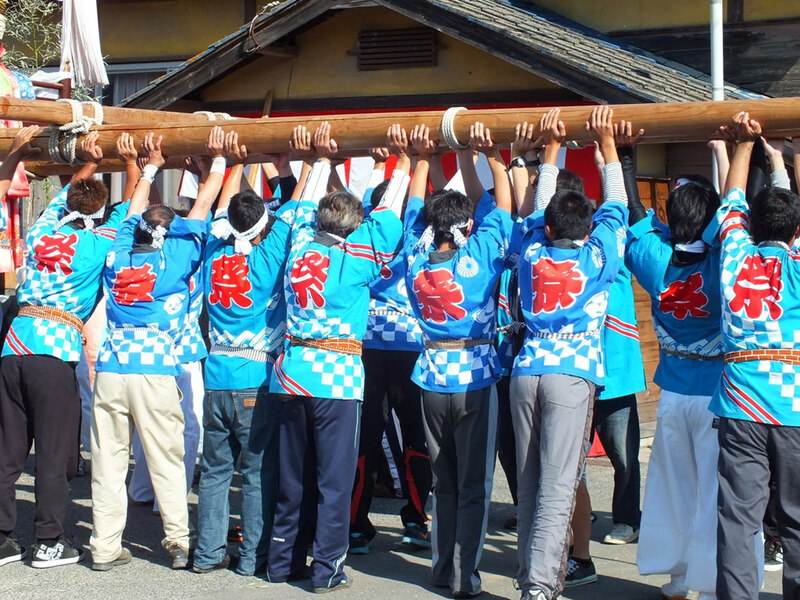 When I discovered it for the first time two years ago, it turned out to be one of the most amazing and unforgettable experiences I had in Japan. 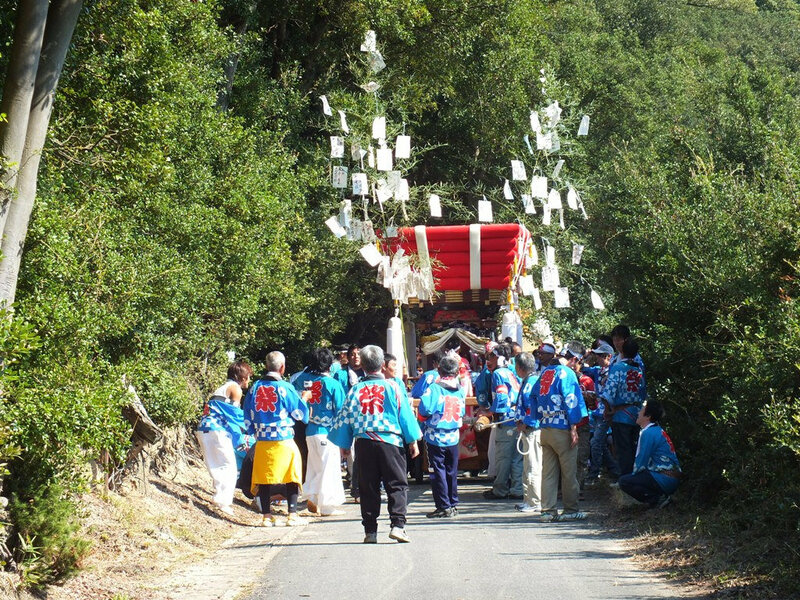 Two years ago, I went to Teshima for the first time. 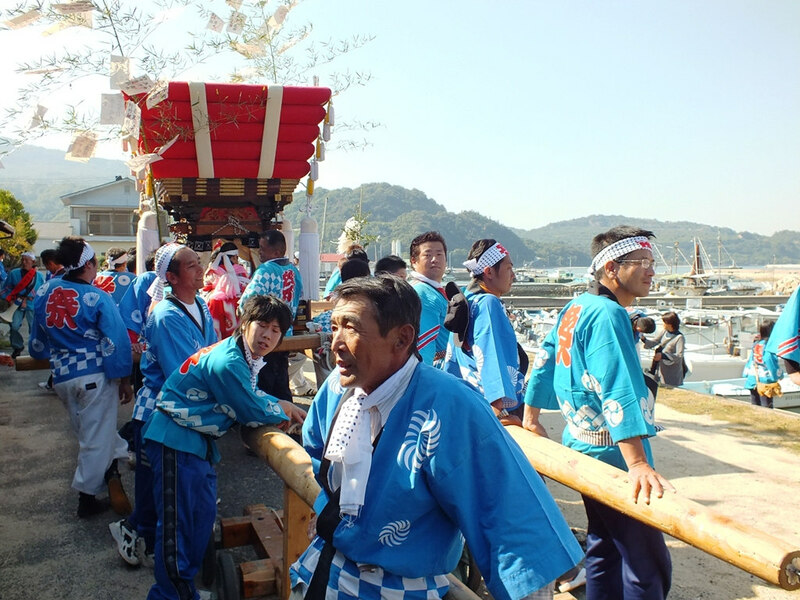 We ended being invited to the Karato Hachiman Matsuri. 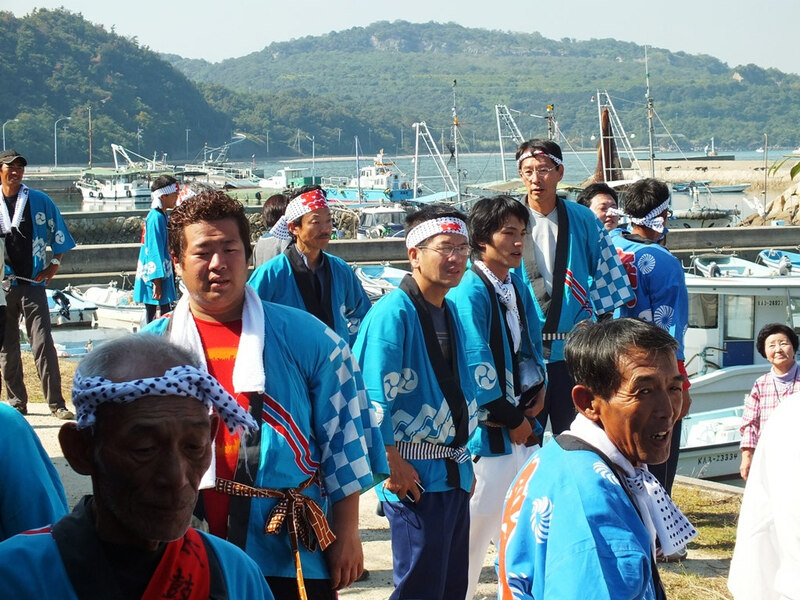 Of course, it is open to anyone and everyone, but we were really welcomed with open arms almost as if we were special guests for some reason (that reason is that the people from Teshima are some of the nicest people I have met). 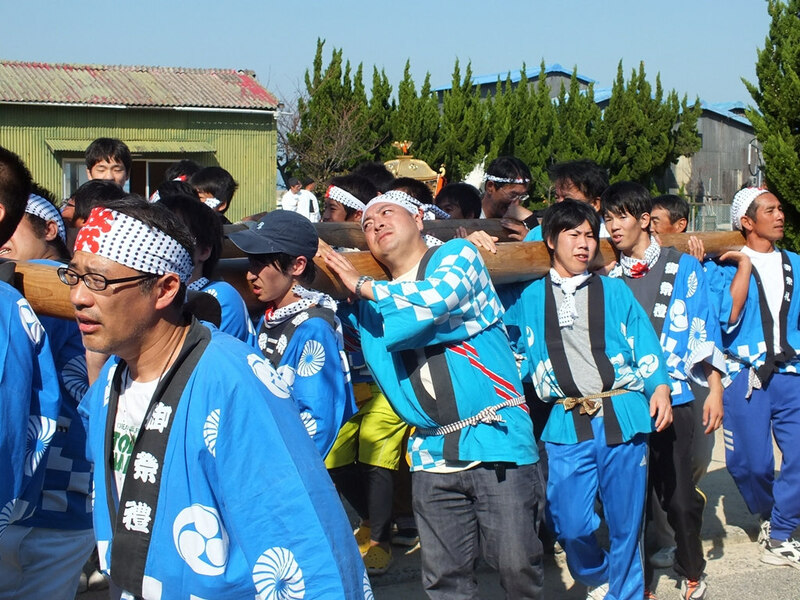 And most important, I ended up carrying the Taikodai. I will never forget that moment. 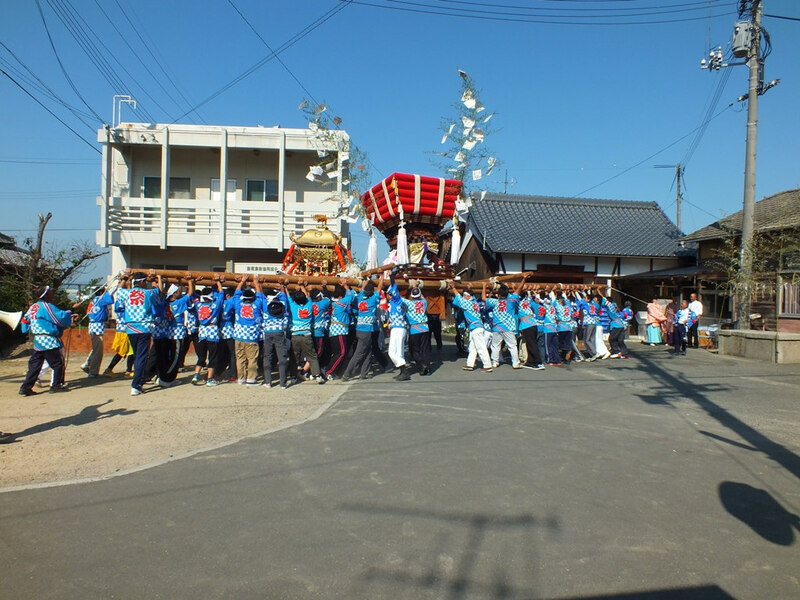 I returned to Karato several times since that day, but I couldn’t attend the Matsuri last year (I was in France) so this year I had to go, no matter what. So there I was last Sunday. This time I only was a spectator, but this is what I wanted to do/be. I actually want to “see” it (when you’re in the middle of things, you don’t exactly have the same perspective, as you can imagine). It was a great experience, once again, albeit too short this time (we had time constraints that we didn’t have the last time). It was good to see familiar faces again, even if I don’t think anyone recognized me (I didn’t expect them to). One little interesting (and not-surprising) thing is that most of the people who spoke to me this time were the same people who spoke to me the last time. So, it almost felt like seeing old friends again. 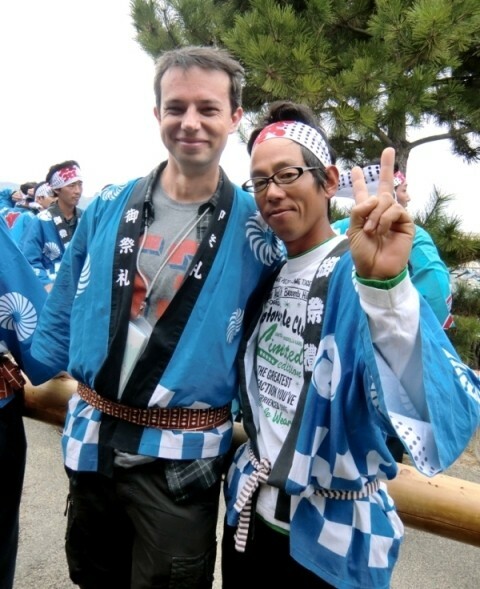 I kinda wanted to tell them: “Hey, I’m the guy from two years ago” but I didn’t (and not only because I don’t know how to say this in Japanese). 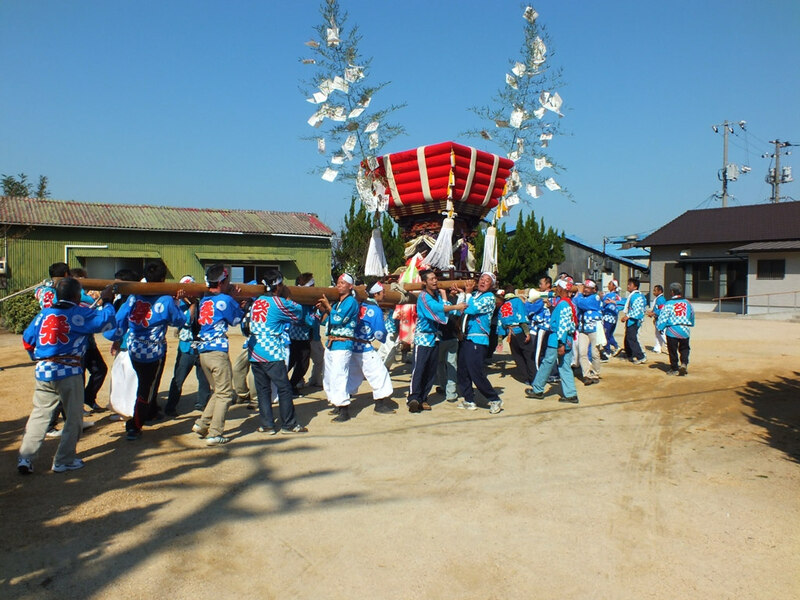 I just wanted to have things unfold “naturally” (and also, I really only wanted to be a spectator this time, had anyone remembered me, I would have ended up carrying the Taikodai again). 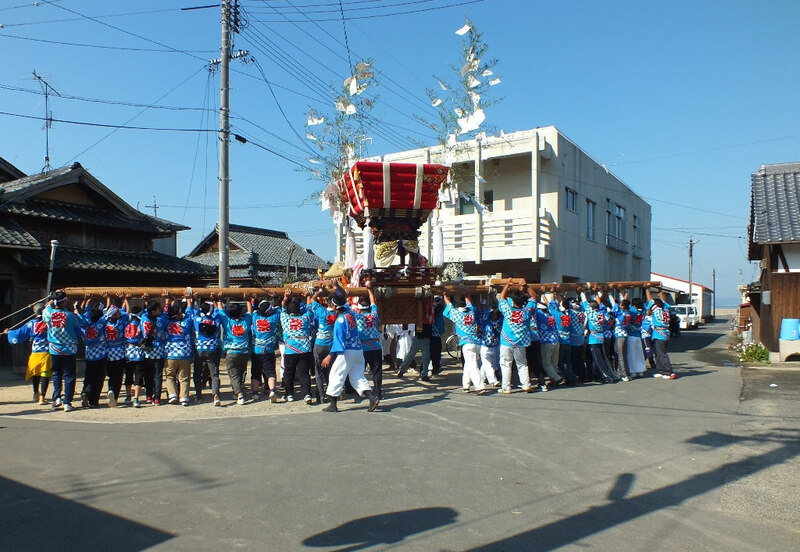 Actually, as the matsuri went on, 康代 ended up telling someone about two years ago, and he did invite me to join the Taikodai again. I promised him I would next year (and I hope I’ll be able to keep my promise). 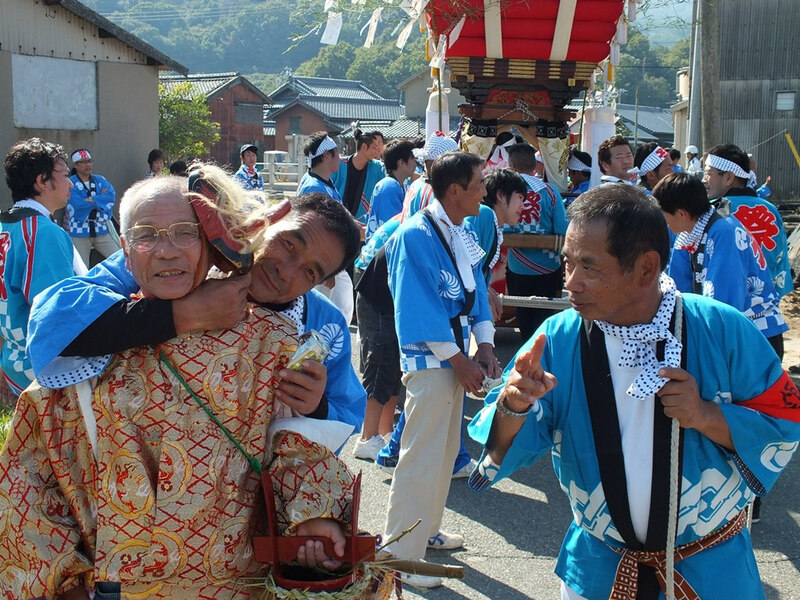 It will be difficult to really describe you the rest of my experience of the matsuri, as my perception of it was very personal, but here are some pictures that will help you get an idea what the Karato Hachiman Matsuri looks like (and to have an idea of my experience two years ago, just imagine me among them with a Happi). 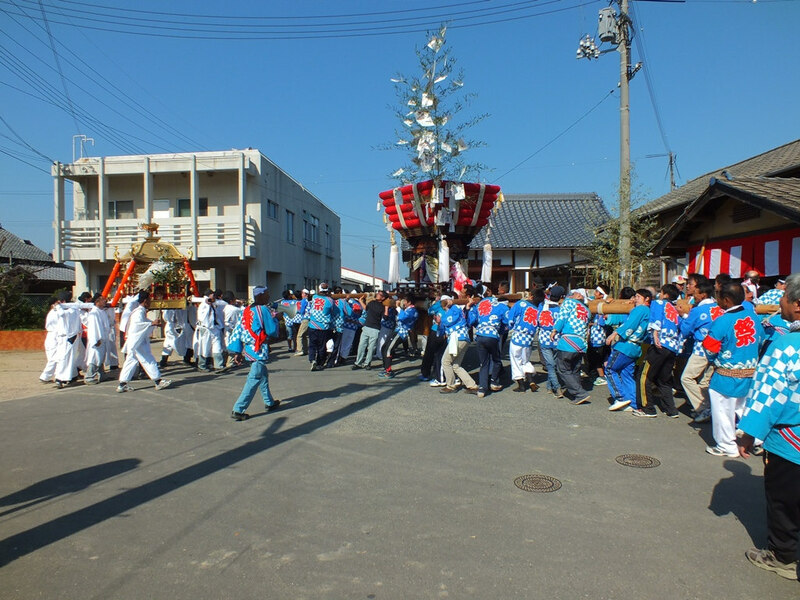 When we arrived, the Taikodai was there, in the middle of the small road. I knew why. 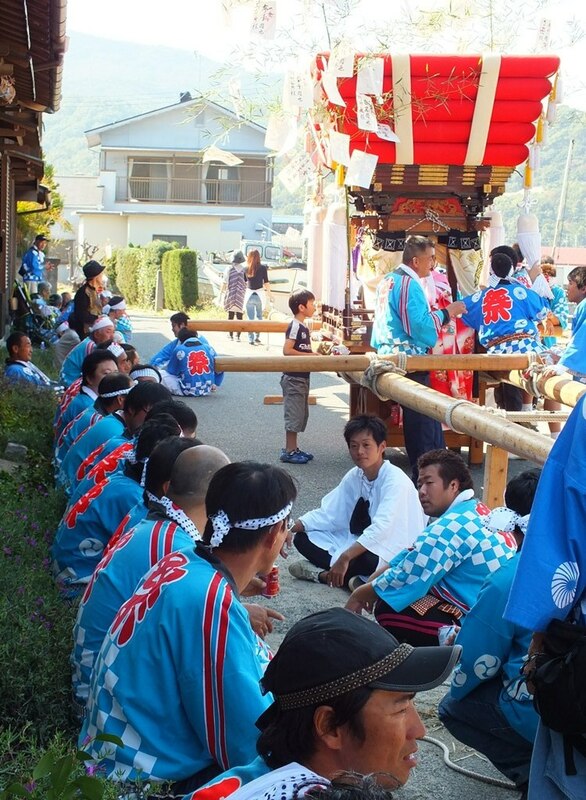 They were resting from their efforts on the shrine’s grounds. Also, a flow of memories and emotions came back right at that moment. 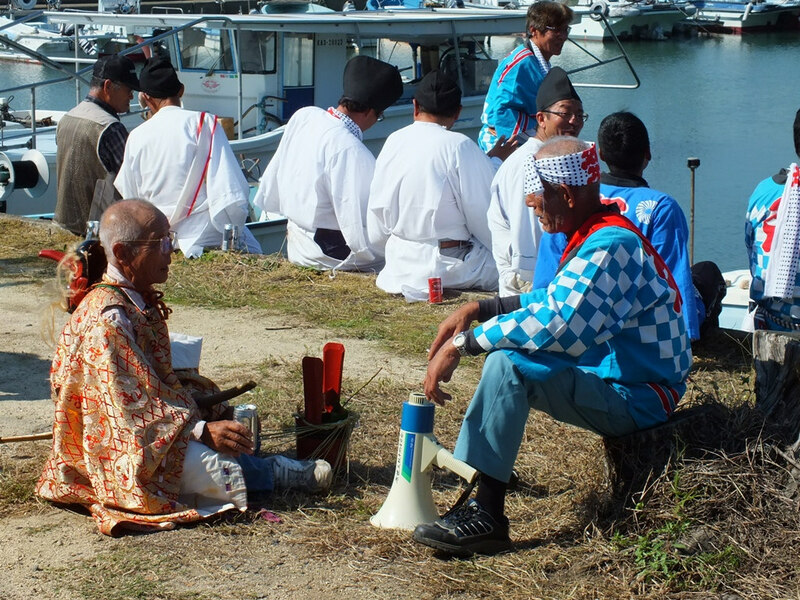 It was when the Taikodai crew was resting on that very same spot two years ago, that I ended up joining it. 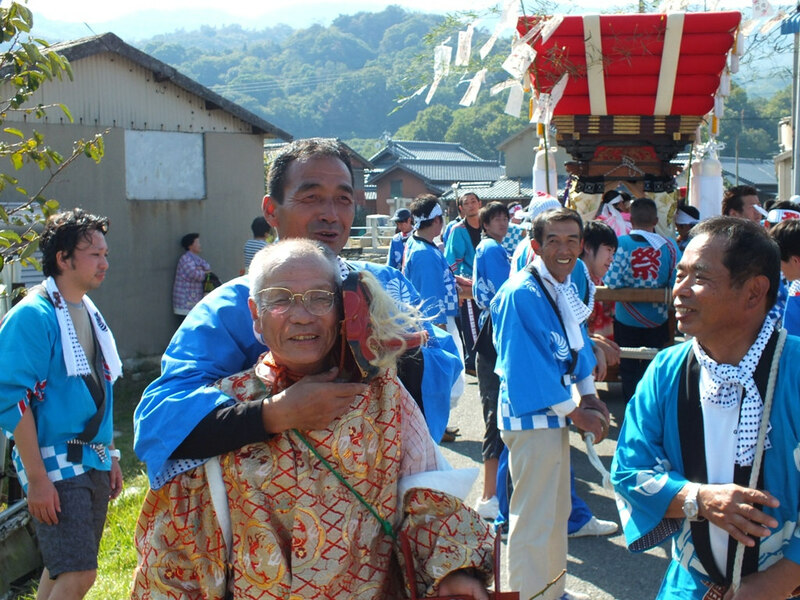 The man on the foreground on the left is one of the men I met both two years ago and this year. Two years ago he was partly responsible for me becoming part of the carrying crew, and this year he invited me again and this is to him that I promised to be there next year. 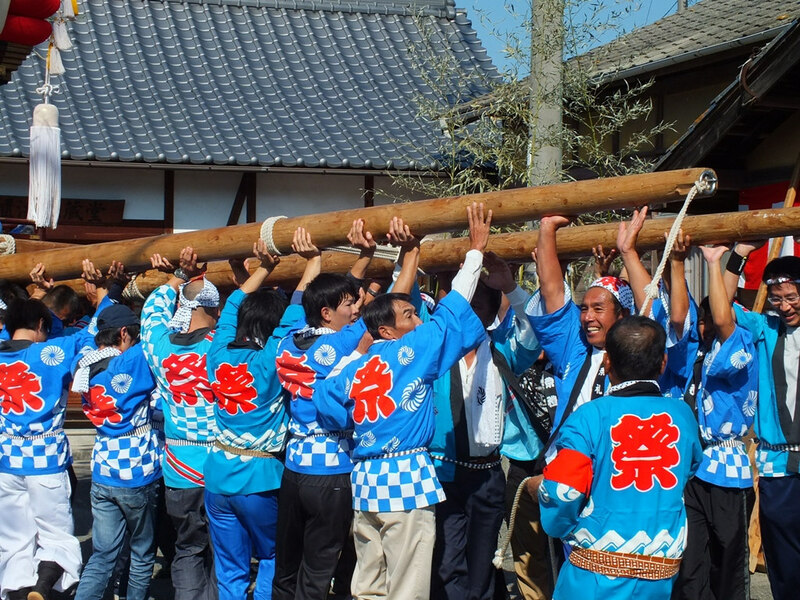 Oh and by the way, let’s not forget that matsuris are not only about getting drunk while carrying large wooden structures. They’re also a religious thing and can include serious elements. So there were familiar faces. There also were unfamiliar ones, obviously. 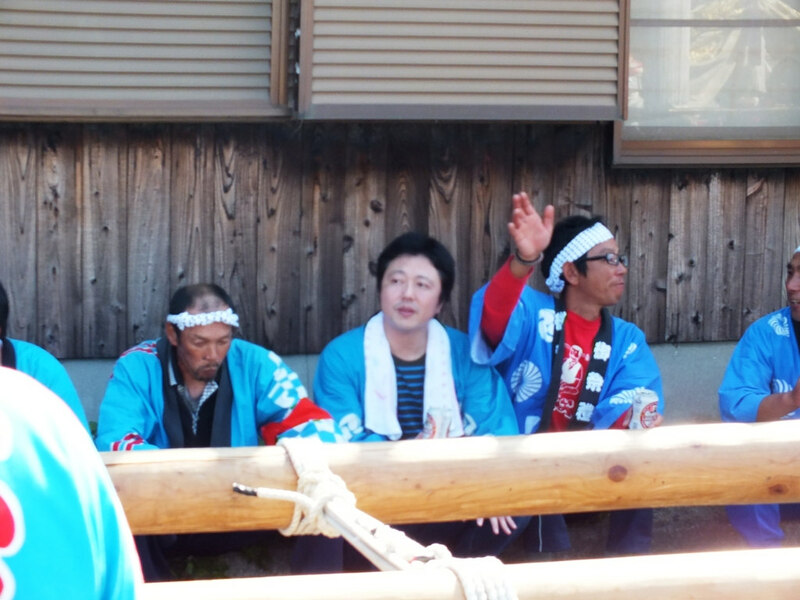 But there also were familiar faces who were absent. 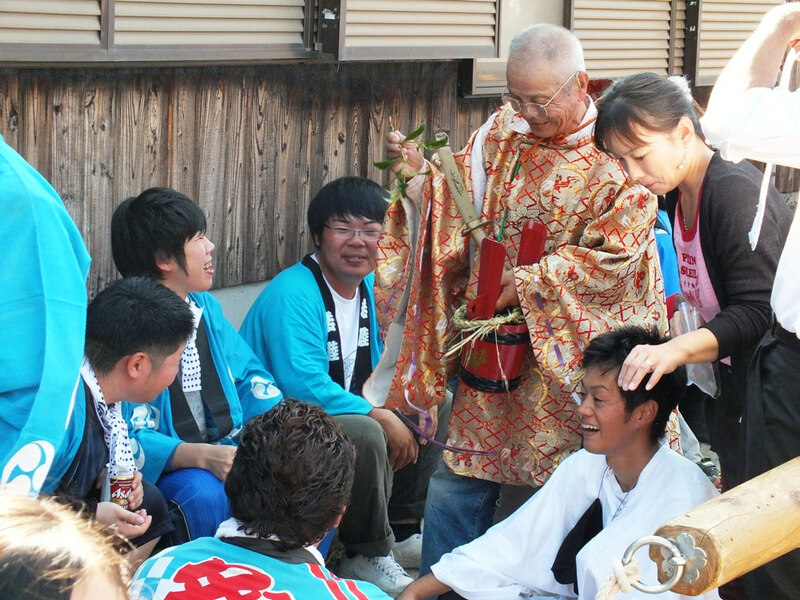 For example, the man in the Tengu costume was different this time around and I didn’t see the man from two years ago. Same thing goes for the tiny old man who may have been the funniest guy around two years ago. When the absent people are old, I can’t help but worry about whether they’re still healthy. 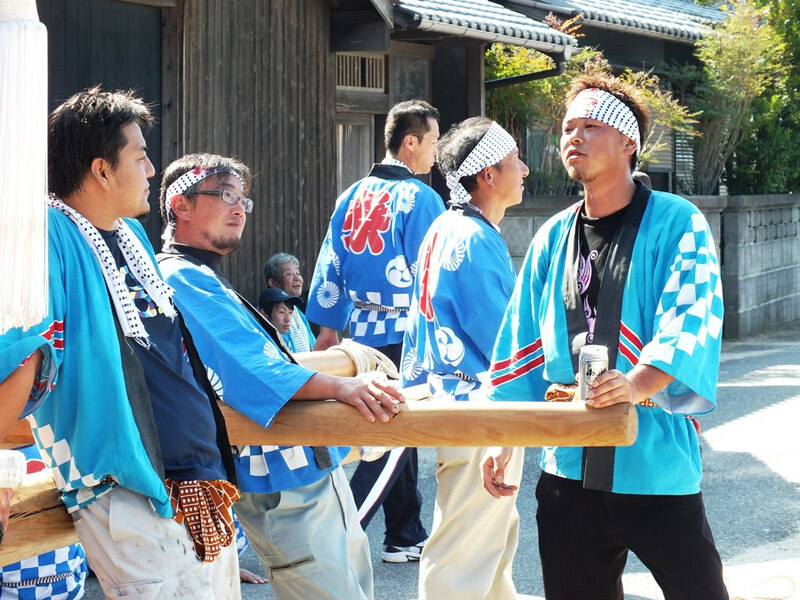 I know, compared to my other matsuri posts, the only impressive thing most of these men do is to down a lot of beer in a short amount of time. As previously mentioned, on that day, the human factor was as important if not more than the spectacular factor. The man in red, who was as drunk this time than the last time, was one of my “friends” from two years ago. 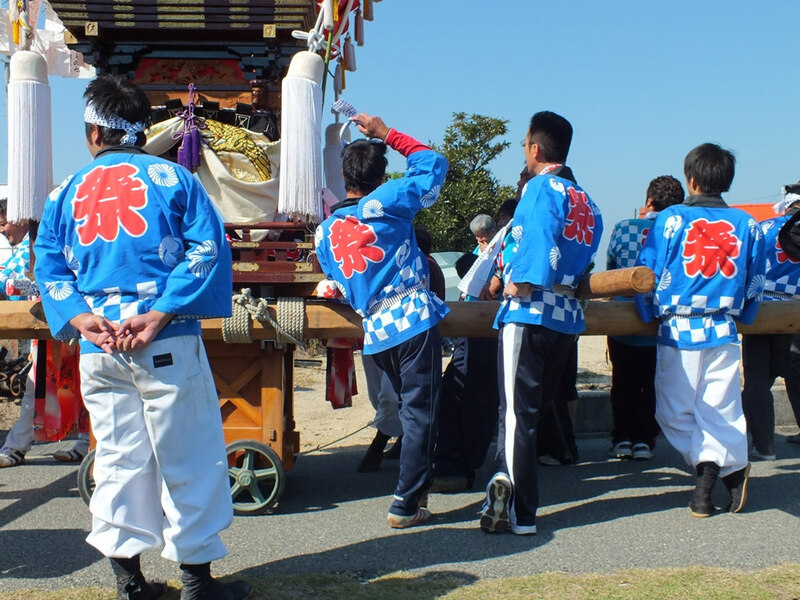 I wanted to talk to him afterwards, but the matsuri finished later than expected and we couldn’t stay, we had to run and take the bus. 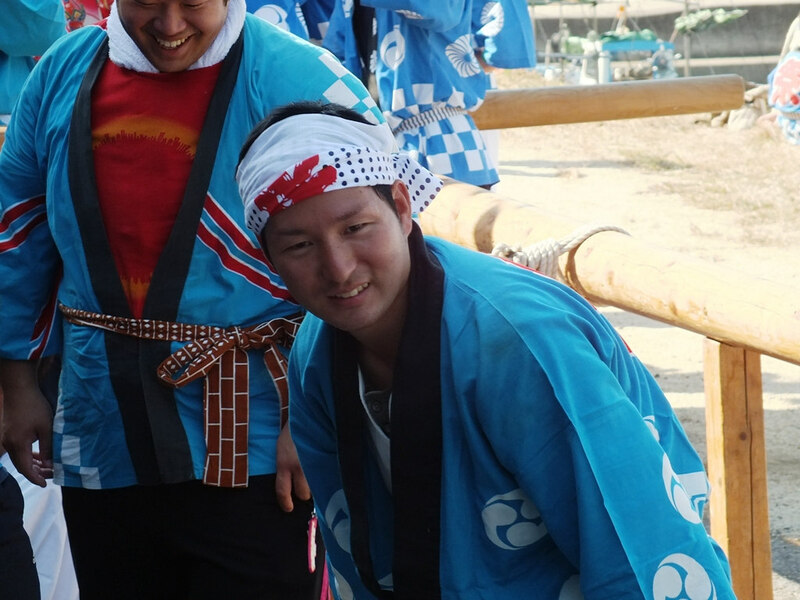 My “taikodai” neighbor from two years ago. We never spoke, but we shared a bond that didn’t require words that day. 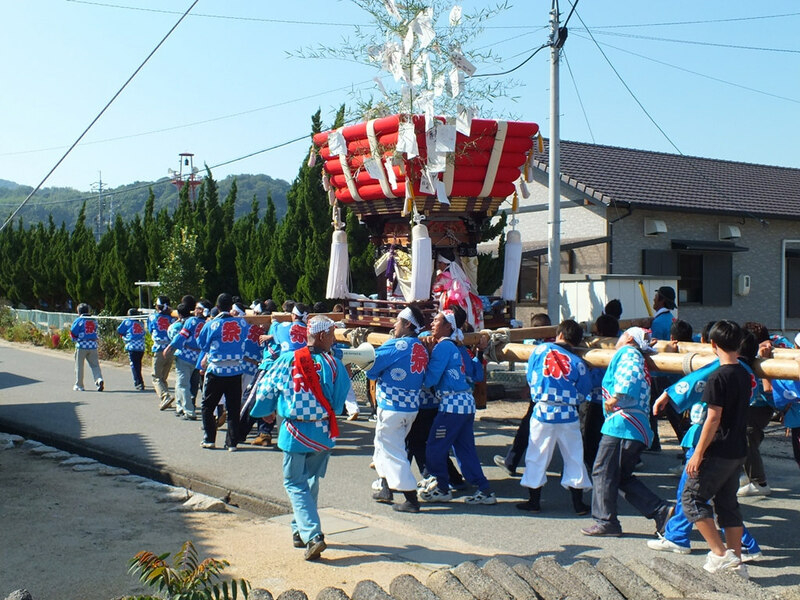 Ok, if you’re still reading, I assume that at this point, maybe you’d like to see the taikodai in action at least a little. 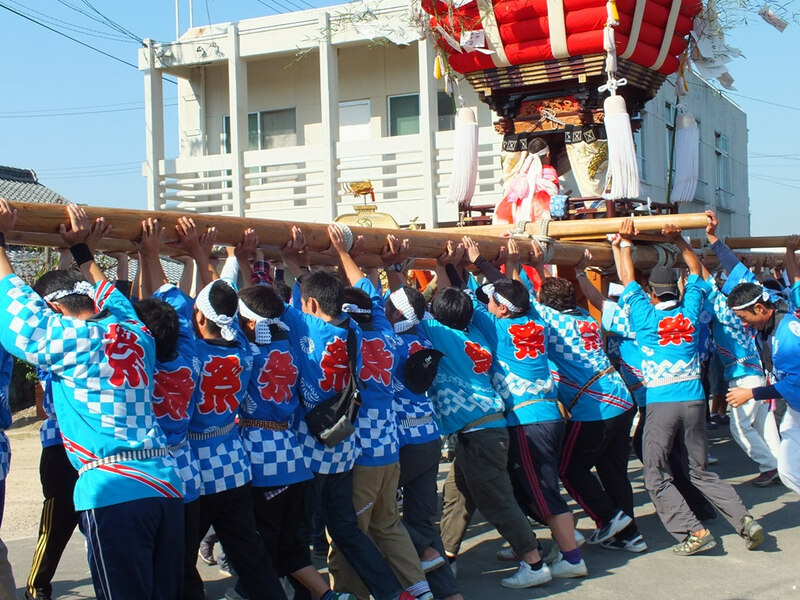 I have the feeling that there were less people carrying the taikodai this year than in 2010. Maybe I should have joined. More or less my spot two years ago. 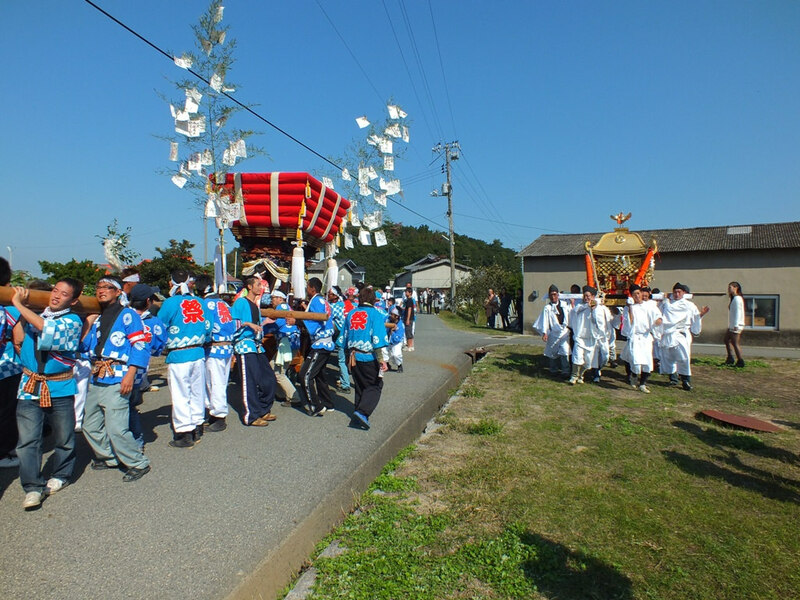 That’s all for today and for the Karato Hachiman Matsuri 2012. 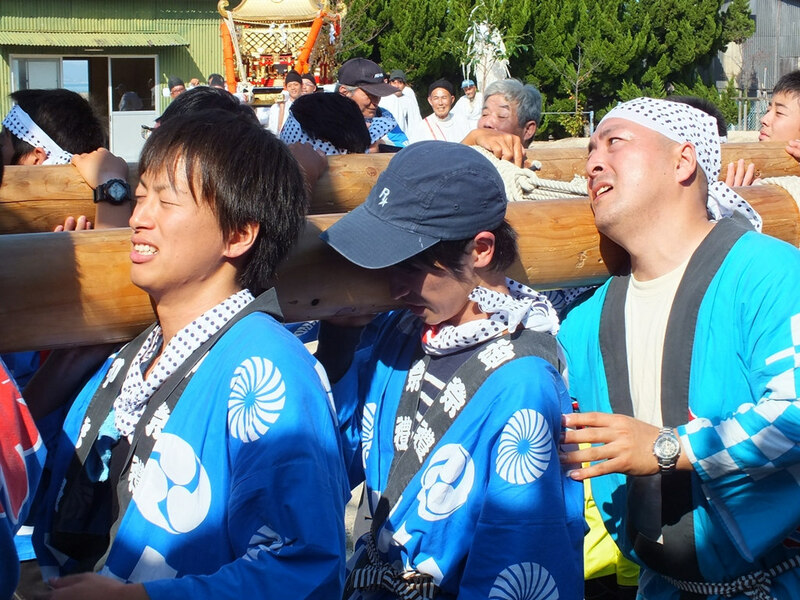 Next episode, next year is all goes well, and if all goes very well, I’ll be wearing a blue happi that day. 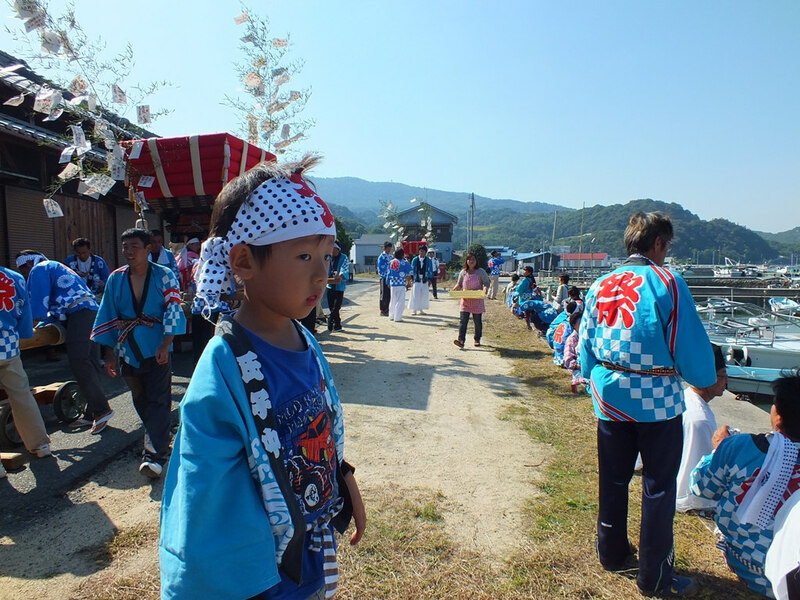 Looks like an amazing time and a great matsuri! I know what you mean when you can’t adequately or possible put your feelings into words. Happens a lot in Japan it seems. Thanks for sharing, and great pics!